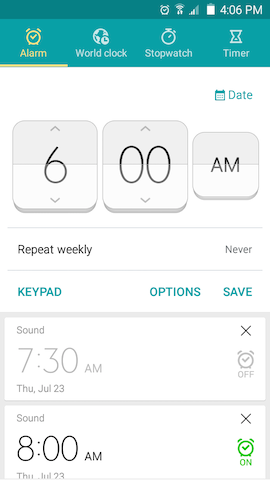 Using the Clock application, you can create and manage alarms. 3. Touch the Alarm tab, if necessary. • Time: Touch the up or down arrows and AM or PM to set the time the alarm will sound. • Repeat weekly: Choose which days you want the alarm to repeat. • Alarm type: Choose whether the alarm should play a sound, vibrate, or both. 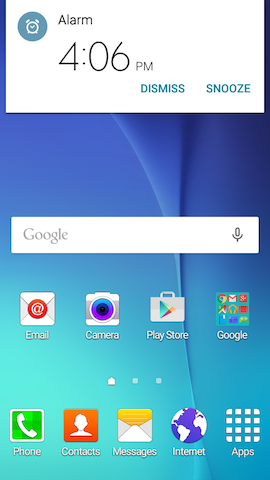 • Volume: Drag the slider to adjust the alarm volume. 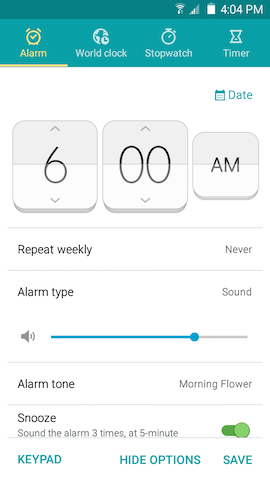 • Alarm tone: Choose the tone played when the alarm sounds. • Snooze: Touch the slider to turn Snooze on . Touch Snooze to adjust the Interval (3, 5, 10, 15, or 30 minutes) and choose if you want the alarm to Repeat (1, 2, 3, 5, or 10 times). • Increasing volume: Increase the alarm volume for the first 60 seconds. • Name: Enter a name for the alarm. The name will appear on the display when the alarm sounds. 5. Touch SAVE to create the alarm. Note: To edit an alarm, touch it in the Alarm tab. •To stop an alarm when it sounds, touch DISMISS. •To use the snooze feature when an alarm sounds, touch SNOOZE. Snooze must first be turned on in the alarm settings. 4. Touch next to the alarm you want to delete. To turn off an alarm and save it for later use, touch . Touch to turn on the alarm.